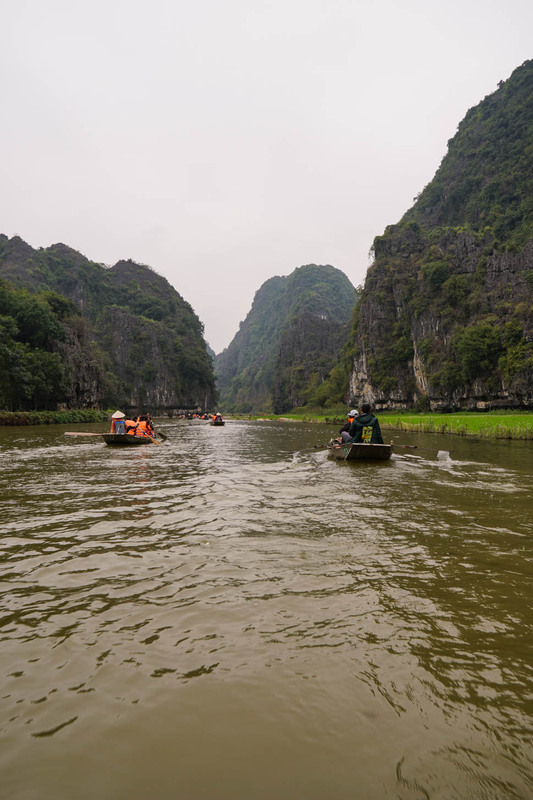 Ninh Binh is a small city located about one and a half hours southeast of Hanoi. My dad told me about this place and when I looked up photos of the area, I knew we had to visit. 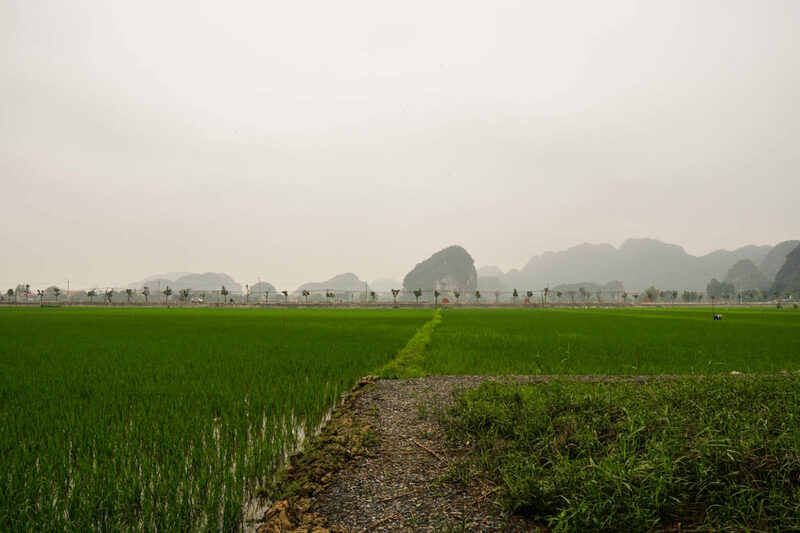 It’s a gorgeous, mountainous area with huge rice fields and a lot of history. I wish we had time to spend the night, but our itinerary was pretty tight, so we did a day trip from Hanoi. To get here, we booked a trip with OneTrip Vietnam. I’ve spent a lot of time watching videos on Best Ever Food Review Show and the company basically sponsors every single video. I’ve also seen people mention them on Reddit every now and then, so I was really excited to see what the tour was like. We got a private tour for our group and it ended up costing about $70/person. 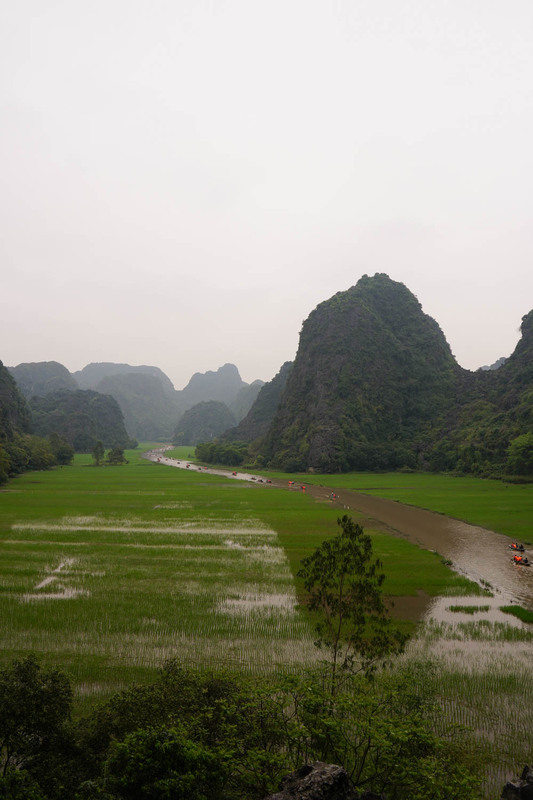 Afterward, we began our ride to Ninh Binh. The first place we arrived was at Hoa Lu Temple. Here, our guide May, told us about the history of the dynasties in Vietnam. It was really interesting for me because I’ve always found it so hard to find information about Vietnam’s history in English that wasn’t related to the war. Next, we stopped by a homestay and rented a bike to ride around the fields. It was gorgeous and such a nice escape from the hustle and bustle of Hanoi. We also got to take a boat ride and take some amazing photos of where the most recent King Kong movie was shot. I think our one day trip was too short since there were a few other sites we wanted to visit, but didn’t have time to. I’m planning to come back in the future. Would I recommend OneTrip? Absolutely! The entire group had such a good time and May was so friendly and understanding. Three of the people in our group wasn’t feeling well since they were recovering from food poisoning and she kept checking up on them. She did everything to make us feel comfortable and she was really attentive. I was really impressed by all the information she shared too. I would definitely recommend booking a trip with OneTrip in the future if you visit Vietnam. I heard they might also be expanding to other countries, so that’s something to keep an eye out for. 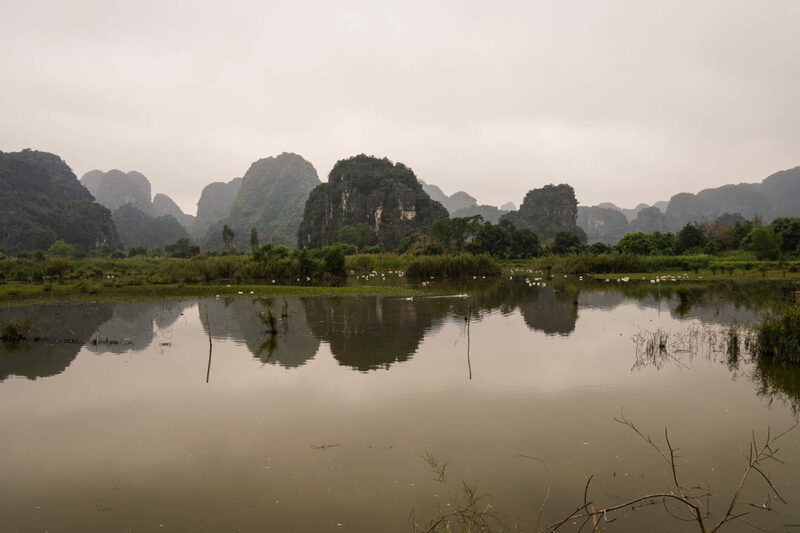 Ninh Binh looks absolutely gorgeous! You should definitely go back! It’s so scenic there! absolutely breathtaking! Wow this is so beautiful! You took really amazing pictures! What an incredible scenery. The nature there is really beautiful. 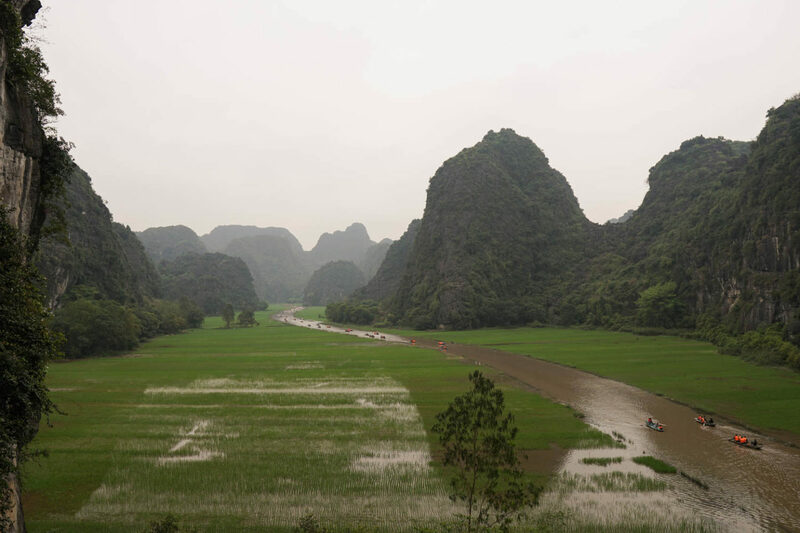 I can see why Ninh Binh is a must visit. seems like the tour you booked was a great one! Great to know that the breakfast was yummy. The boat ride there must have been a lovely experience, considering how beautiful this area is. What a serene place- it looks so peaceful! 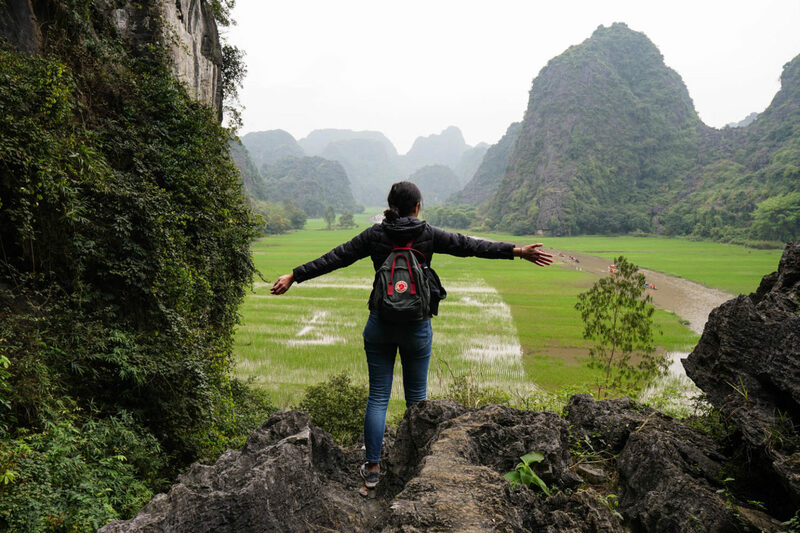 Wow, this looks such an amazing trip, and I’m definitely adding Ninh Binh to my travel bucket list! I also love King Kong, so that’s super cool! Wow, what an absolutely gorgeous place. It looks like the sort of place I’d go to to have a detox from social media and the internet – and your photos are absolutely gorgeous! Looks amazing there! Loved your photos. What a magical place. I love the rolling hills?? err.. mountains? So breathtaking! Those mountains look amazing, so dramatic. It must have been so beautiful going down the river. Wow this looks like the most incredible trip! I definitely need to go here! What a majestic sight. Great photos dear. Thanks for sharing! Love those pictures! Amazingly captured! The Images you have added are so beautiful.I am think to go somewhere over to the hills with the family. There was some typo error.Pardon!! Such an interesting place. I haven’t seen something like this, a river in between rice fields. That’s one awesome adventure you had. What a stunning place. I would love to see this, Vietnam has been on my bucketlist for years now. This looks dreamy! I’m so amazed! The views are stunning! Everything looks so green and peaceful. The South East Asian region has become increasingly popular as a destination for those travelers seeking a more adventurous holiday than can be had merely sipping fruity, ice-cold drinks at your typical beach resort.